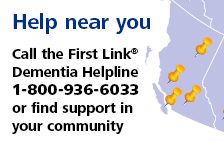 Family caregiver series | Alzheimer Society of B.C. The Family Caregiver Series is a five-session education series for family members who are caring for a person with dementia. Participants will learn about dementia, practical coping strategies and early planning. Participants will receive basic information about dementia and the impact this disease has on the individual, caregivers and families. Through an exploration of how dementia affects the brain and behaviour across the progression of the disease, caregivers will learn what to expect throughout the journey with dementia. Caregivers will gain an understanding of how communication is affected by Alzheimer’s disease and other dementias. They will also have the opportunity to explore effective ways of facilitating communication and providing support to the person with dementia. Changes in the brain due to Alzheimer’s disease or another form of dementia often appear to us as changes in the person’s behaviour. Caregivers will learn how to understand behavior as a form of communication and explore strategies for determining what the person with dementia might be trying to communicate, finding ways to decrease the occurrence of behaviours that concern us and responding in supportive ways. Starting to plan for the future as early as possible ensures that the person with dementia can play a role in making important health-care and financial decisions. Family caregivers will learn the importance of early planning and review strategies for ensuring that the wishes of the person with dementia are honoured now and in the future. When supporting a person with a chronic illness such as Alzheimer’s disease, it is vital that caregivers take care of their own physical and mental health. Participants will gain an understanding of how certain messages, demands or beliefs can contribute to stress and burnout. They will also learn how to recognize the signs of burnout, and discover ways to deal with caregiver stress. Contact your local Resource Centre to learn about upcoming opportunities to attend a Family Caregiver Series.